Conventional steam-assisted gravity drainage (SAGD) involves a horizontal well pair typically spaced 5m apart vertically with the injector well located above the producer well as shown. The wells are connected hydraulically during a steam re-circulation phase, followed by the SAGD production mode, i.e. continuous injection of steam and the continuous extraction of liquids. Performance of conventional SAGD can be significantly impacted in formations with low vertical permeability and interbedded mudstone layers impeding vertical drainage and hindering or delaying the startup phase. The Azi-Frac horizontal open-hole stimulation method installs vertical propped planes from the injector well at ~50m spacing along the wellbore, thus hydraulically connecting the injector and producer wells. The vertical propped planes orientated orthogonal to the injector wellbore are propped with a high permeable 12/20 garnet sand proppant. The injector well is completed following the open-hole stimulation with a conventional slotted liner. Reservoir simulations of conventional SAGD can be highly unreliable due to the difficulty in estimating formation vertical permeability under steam and its significant impact on SAGD performance. 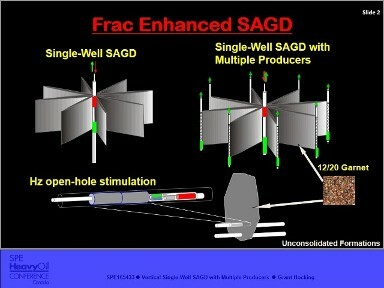 The frac enhanced SAGD being virtually independent of formation vertical permeability, enables reservoir simulations to be conducted with a high degree of confidence. Reservoir simulations of the frac enhanced SAGD in 52m thick McMurray formation containing Athabasca bitumen at Firebag, show that the frac enhanced SAGD outperforms the best SAGD well pair in a clean McMurray channel sand by a factor of 6 in production rate, operated at 1,850kPa. The CSOR differ by a significant factor, 1.6 compared to 3.2. 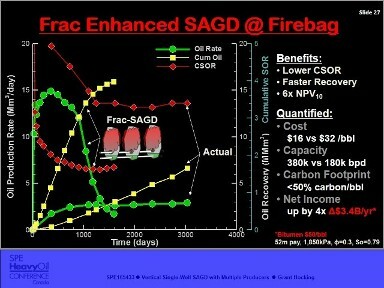 The frac enhanced SAGD has a NPV10 of 6x conventional SAGD in a clean McMurray channel sand at Firebag. Frac enhanced SAGD performance in low vertical permeability and/or multiple low-permeability horizontal layers, indicate that the vertical drainage efficiency of the system is virtually independent of geology, provided the propped vertical planes are constructed continuously throughout the pay thickness. Thus the flow conformance to the producer is assured in the frac enhanced SAGD, since it is virtually independent of the formation vertical permeability, and therefore removes the necessity for installing ICDs in the producer.